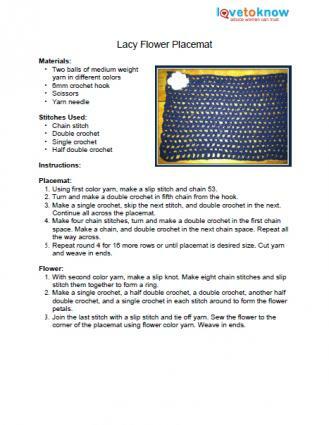 Crochet placemat patterns can be used to make beautiful gifts for any occasion. 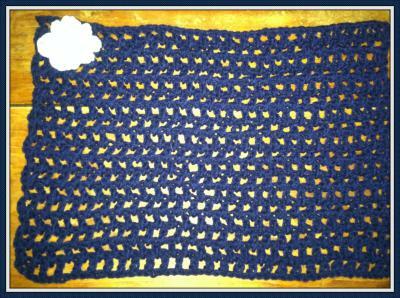 The best part is that you do not have to be an expert crocheter to make a lovely and practical crocheted placement. The projects featured below are perfect for those just beginning to crochet. 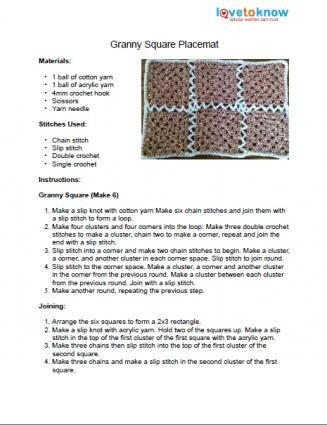 The following crochet placemat patterns are free to download and use. Open them by clicking on the pattern itself, and then saving or printing out the .pdf document that has opened in a new window or tab. If you need help downloading the patterns, check out these helpful tips. This placemat has a warm country feel to it and is right at home on a rustic farm table. Use whatever colors you'd like to suit your tastes and decor. Click to open this printable pattern. For those seeking a more elegant placemat, this dainty, flower embellished piece adds charm to any place setting. Click to download this placemat pattern. Besides using the placemats for an attractive embellishment on your dinner table you can also use them for a number of other things. These placemats look lovely when placed under a candle, table decoration or on your bedside table. Use them anywhere that you need a little boost of color and interest or to protect furniture. Christmas Placemat: This attractive placemat is a great way to celebrate the season. Although the design is rather intricate looking, it is not overly complicated to craft. Heart Placemat: Make this sweet placemat in red and white and use it for a romantic dinner for two. A great way to say "I love you." Easter Egg Placemat:This cute little placemat is in the shape of an egg and makes the perfect addition to your Easter celebration table. This is another good project for the beginner crocheter. Butterfly Placemat: Three butterflies adorn this tightly woven placemat. Use this mat anytime you need a fun embellishment for your table. Placemats are simple projects that you can stitch up quickly, so it's easy to make an entire set. You can make matching placemats or use the same pattern with a variety of colors of yarn to add some whimsy. Use these patterns to create lovely place settings for yourself or thoughtful gifts for friends and family.